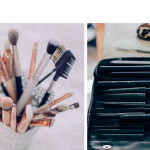 The place has a happiness quotient to it. 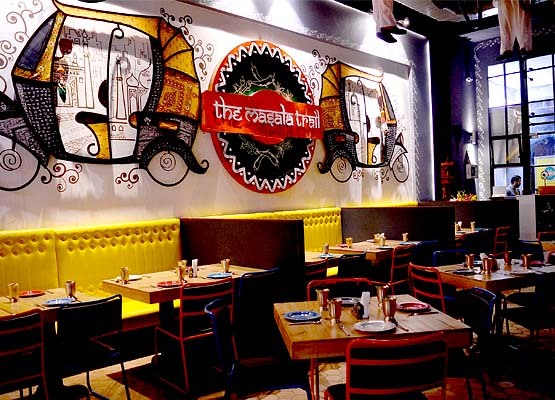 In its new avatar, a remake of the old Shiv Sagar which it used to be, The Masala Trail is a chic, spatial and colourful multi-cuisine restaurant with interesting wall murals. The place has been quirked up with a fresco on the ground floor with indigenous three wheelers going out in the opposite directions, a red Bajaj Super hanging from the ceiling and some nice bright coloured chairs and sofa for the seating. The First floor is rather quieter, has a subtle look with Mandanas painted on brown walls in an obvious contrast to the brightly done grounder floor. But what gets you, the moment you enter the place is the vibrancy of Masala Trail. It was jam packed when we stepped in for lunch and we settled for a seat on the first floor. Osama Jalali met us soon after. 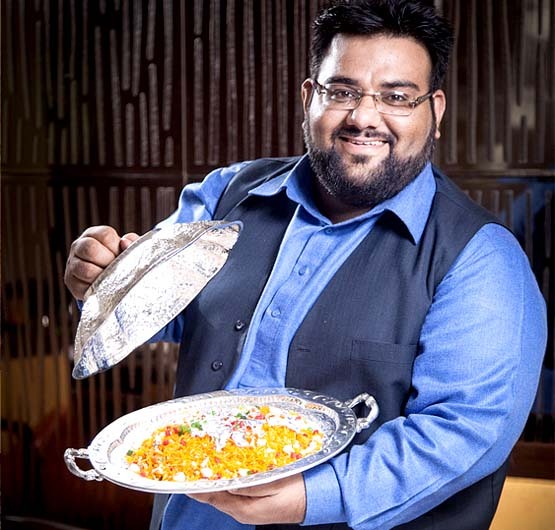 For the ignorant few, Osama is the food connoisseur who is a not just a chef but a food historian, writer, reviewer, researcher and Food Festival Curator too; the knight in shining apron who has revived old recipes from Rampuri, Shahjahani and old Mughal cuisine. Apparently, he also runs a group called the Lost Recipes of India. The thing about food is not just in its taste and yet it’s the taste that brings you back to it, because as they say, the proof of pudding is in its taste. And The Masala Trail scored a perfect ten when it came to that. 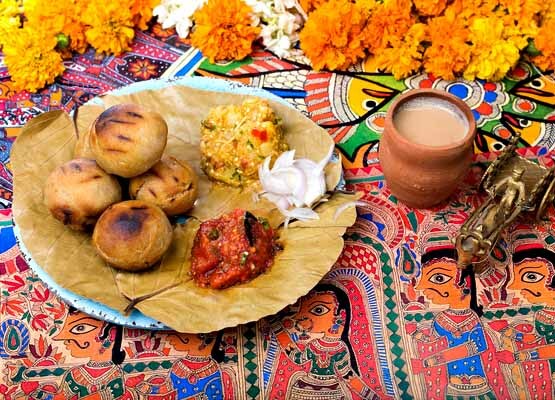 Interestingly, Osama has brought street food from all over India under one roof for his guests and for the convenience of understanding the menu catalogue is divided into four zones Purab (East) Paschim (West), Uttar (North) and Dakshin (South) with respect to its native speciality. And it’s a pure vegetarian restaurant! The Tomato Chaat we started with was hot, unlike any chat I have had before and it impressed me. Served in a terracotta wide dish, the serving was sumptuous with the right mix of sweet, sour and salted. The next speciality was Tower Chaat, a great mix of everything that makes for chaat in India, the dish is served in a broad tall glass to hold the tower of a chaat. It had everything a chaat lover wants and the fact that it looks unending is satiating enough! On Osama’s recommendation we tried the Paan Ki, a Gujrati special that has paper thin layering of otherwise famous Chila, cooked inside a banana leaf and served with hot mint chutney. The delicacy is worth a try anytime. 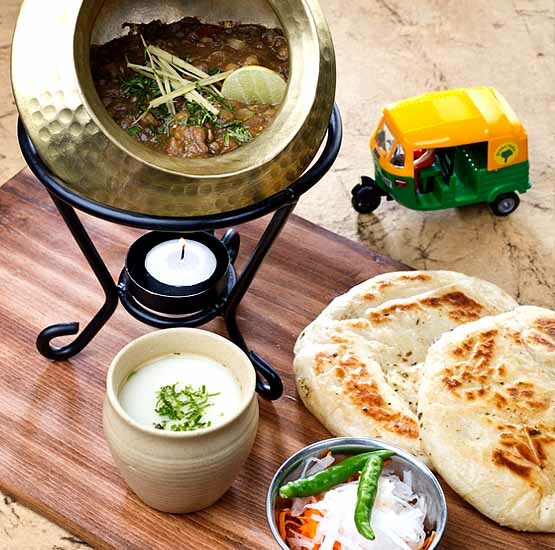 It is indeed impressive to realise how every dish at The Masala Trail was true to its native taste. The Lithi Choukha and Banarasi Kachouri Sabzi followed by Phirni, were the final dishes, to sum it all. 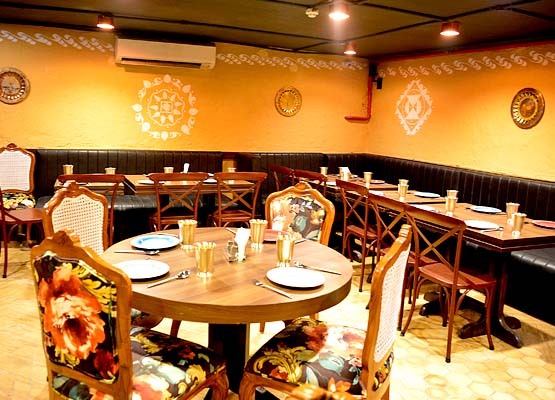 Good ambience, good service and great food, The Masala Trail stars at 4.5 stars on a scale of 5 for team GlobalFashionStreet.